Published January 17, 2019 By Anna T. This post may contain affiliate links. Regardless, I only recommend sites I've researched and/or used and trust. 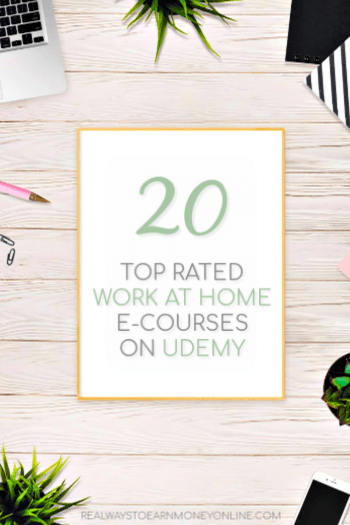 Today, we are discussing some of the top rated work at home e-courses available on Udemy — and this is a great time for it! It's the beginning of a new year — a time when people traditionally review their triumphs and mistakes as they start planning for the future. The goal is to make the next year better than the last one in every conceivable way, and for many people who desire a simpler life with more flexibility and more time to spend with their loved ones, finding a good way to earn money from home might be exactly what they need most. Unfortunately, it can be tricky to make the transition to remote work from an ordinary job. It isn't necessarily difficult to find work from home positions—lots of smart companies are hiring remote workers these days, with new ones jumping in all the time — but there are also a lot of scams out there, and it's easy to get lost or waste time pursuing jobs that aren't really worth the effort. Enter Udemy. They're one of the most popular online educational resources, with an incredible library of courses available. No matter what you need to learn, no matter how obscure it might be, you can probably find a fantastic course on Udemy that will deliver all the important information in an easily digestible way. Udemy Offers Lots Of Work at Home E-Courses! In the work at home sphere, Udemy has a sizable selection of courses that give you a general overview of how to get started, and several that provide detailed instructions on how to succeed in certain popular work-from-home niches. These courses cover all sorts of really important things, like where to look for jobs online, how to spot legitimate opportunities and avoid scams, how to make money as a freelancer or create your own business. There are courses for literally everything, with hours and hours of lectures, and many of the top-rated offerings are very inexpensive. I noticed several decent-looking courses that were only $11, which is a small investment, especially considering how much money you could earn from a good work at home job or business venture and all the aggravation you'll avoid by arming yourself with solid information on the fundamentals. To get you started, I've compiled a list of some of the top-rated work at home courses available at Udemy. Some of these are general courses, while others are focused on specific types of jobs. There are, of course, thousands of other interesting courses I couldn't include for various reasons. Some just didn't quite make the cut, and others were a little too specialized or focused on very obscure niches. Hopefully, you'll find exactly what you're looking for on this list, but if not, just know that there's a lot more good stuff out there, and it might pay to look around at some of Udemy's other offerings to see if anything captures your interest! This deals with all aspects of working from home, including how to start your own business or find a good source of reliable employment, and everything in this course is aimed at mothers trying to stay home with their kids while still earning a stable income. There's a lot of info on work/life balance, and creating a flexible schedule so you can deal with the kinds of unexpected things that often come up for working mothers. Work From Home Jobs: Top 10 Best Freelance Jobs! A general course that covers numerous different ways to earn a living from home as a freelancer. This might be especially helpful for someone just starting out. This course deals with four of the main paths to beginning a successful home-based career and shows you all the steps you'll need to get started. Looks like a good choice for people who aren't sure whether or not working at home would be right for them, and want to get a general overview of the landscape. This is another course aimed at beginners, and it's fairly inexpensive. Learn how to find good job opportunities, avoid scams, and cultivate a mindset that will help you succeed in the work-at-home arena. If you need a job right now, you might enjoy this course that focuses on attaining speedy employment. You'll learn secrets to better showcase your skills and impress potential employers, how to find jobs that aren't advertised and methods for automating your job search process. This course deals primarily with the challenges of creating your own online business and running it from your home. You'll learn how to be your own boss, deal with the unexpected, increase your productivity, and much more. Another course for aspiring entrepreneurs. Seems to be aimed at people who already have a primary income source, but want a small part-time home-based business for earning some extra cash. Copywriting Master Course – Work From Home 3 Hours A Week! This very highly rated copywriting course covers pretty much everything you could ever want to know about both the craft and the business side of the online word-spinning biz. It will show you how to sell yourself, give you a full rundown of all the major online marketplaces, and provide a thorough education on the actual nuts and bolts skills needed for writing compelling copy that makes clients happy. Another interesting course on freelance writing. If you're tired of churning out thousands of words for low-paying content mills and want to get into the big leagues, this course might be a good choice. This nifty little course will show you how to take old furniture, fix it up, refinish it, and then sell it again for a profit. The subject is a little obscure compared to most other courses on this list, but it's the sort of skill that you could use to make money in a lot of different ways. This was the one of the highest-rated courses I could find on work at home transcription. There are lots of transcription jobs out there, but you need to really refine your skills to make decent money at it. This inexpensive course should help with that. Social media management jobs are popping up all over the place these days, and many workers in this niche also make an excellent living as freelancers. This course will teach you everything you need to know about this exciting field, including all the secret skills that pros use to keep their clients happy. A highly rated course with a lot of practical information about flipping used items on eBay. This can be a very lucrative business, and some folks earn a full time living doing it, but there are some very specialized high-level tactics you'll need to learn if you want to make it work. A course like this should give you a good head-start. If you're an artist, and you'd like to make a living doing something you love, check out this in-depth course for setting up an Etsy shop to sell your art. You'll learn how to write compelling art descriptions, how to package your creations when shipping to customers, and how to take professional looking photos that show your work to its best advantage. Fiverr is one of the easiest freelance markets to get into, which makes it a good place for beginners in a variety of fields to launch their careers. If you have an interest in becoming a freelancer, this course will show you how to establish yourself on Fiverr the right way. It includes a lot of potentially useful info on customer relations and sheds light on some of Fiverr's more annoying quirks so you can avoid many common novice mistakes. Phone jobs are a huge part of the work at home marketplace, especially jobs that involve selling products over the phone. Unfortunately, a lot of people are hesitant to even try for these jobs because they lack confidence in their communication skills and have no idea how to sell things. This course could be a big help. It will show you how to cold call without fear, how to recognize buying signals during customer conversations, and how to build rapport with new people quickly. A course on remote ESL language tutoring. This is mostly focused on starting your own online business, a career path that has the potential to make you a lot more money than getting hired by one of the big language teaching companies. If you're already a tutor and would like to increase your income while gaining more independence, this might be worth looking at. A very popular course with more than 300 reviews and a fairly high rating. Learn everything you could ever want to know about becoming a freelance language tutor. There seems to be quite a bit of good practical information here about mastering the actual tutoring process, along with plenty of good business advice. Selling photographs on stock image sites can be a great source of passive income, but you need to know what you're doing or you could put in a lot of effort without making much money at all. This course will show you how to tell the difference between photos that will sell and those that won't. Plus, you'll learn how to best put your photos out on the market for maximum visibility and profit. One of the most interesting new ways to make money online is selling your expertise by creating an online course. Udemy is obviously a top-notch marketplace for that sort of thing, and this highly rated course is full of practical tips on how to choose a course topic, put together an appealing presentation, and structure your information to make it easily digestible. Who knows? Maybe the next time we do a list like this, your course will be one of our choices! Overall, Udemy is a great resource for people who need to gain valuable new skills, but don't have the time or money to attend classes in person. We hope the list above gave you some good ideas for how to take the best advantage of the work at home training available there. Services like Udemy have put education in reach for people of all backgrounds and income levels in a way that's never been seen before in history. No matter what your situation is now, if you have an internet connection, a curious mind, and a dedicated heart, you can still find a way to improve your job prospects and make a better future for yourself. If you know of any other great work at home Udemy courses you think should've been included, drop us a message in the form below. We'd love to hear from you.